For decades, OPEC has been able to hold over our heads the threat of cripplingly-high oil prices. With +30 million barrels per day of the world’s oil production, OPEC’s ability to manipulate the price of the commodity is undeniable. This has led to a maddening amount of our foreign policy being dictated by the only product supplied by this Middle East cartel, thus giving OPEC nations a bizarre amount of global power relative to the influence these countries would have otherwise. 17-cent Cryptocurrency To Overpower Bitcoin? Bitcoin has been the HOTTEST investment over the past decade… But… a brand-new cryptocurrency could begin to overpower Bitcoin. In less than two months, it could easily skyrocket in value by 500%... 1,000%... 1,500% or even more. This is your chance to turn a tiny grubstake of $20… into an absolute fortune. The best part: You don’t need to know anything about cryptocurrencies to make heaps of money! This quick video will show you everything you need to know… If you missed out on the “big money” from Bitcoin’s historic rise, you won’t want to miss this. Click here to discover more about what we’re calling “Super-Bitcoin”!. Thankfully, as I’m sure you are aware, the clock is ticking on the influence OPEC holds. That’s because the transition to electric cars is now full speed ahead which should significantly lessen the world’s oil demand. For thousands of years cobalt has been used by humans as blue coloring in glass, pottery and ceramics. In recent years cobalt has found a whole new level of popularity as a key component in the lithium-ion batteries that are used in electric cars and in batteries that capture the energy produced by renewable sources. When it comes to cobalt, what you need to understand (and you likely already do) is that at this point the electric car revolution is just getting started. The number of electric cars on the road today relative to the total cars on the road is still just a rounding error on a rounding error. That is quite a move given that we haven’t even scratched the surface on the amount of cobalt that is going to be required as this electric car transition ramps up. But remember, this is just the beginning. We are going to need a lot more of it as electric car usage grows. Further, demand is going to come from our need to store energy generated by renewable sources such as wind and solar. You see, ninety-nine percent of the cobalt produced today is as a byproduct of nickel or copper production. That means that for those mines, a rising cobalt price is virtually irrelevant because it is such a small portion of the economics of the project. This is important because it means that for almost all the current cobalt supply, a rising cobalt price isn’t going to stimulate new production. This not a country that you would want to hold the majority of this resource that is critical to the electric car revolution. In case you were thinking DRC leaders might be naïve to the powerful position the country is in when it comes to cobalt, don’t worry. They aren’t. The DRC’s President Joseph Kabila just signed into law a new mining code that will see royalties on revenue from cobalt production quintuple from 2% to 10%. That decision was made despite significant opposition (as you can imagine) from the global mining companies operating in the country — Glencore, China Molybdenum and Randgold. “We have to make sure for the next 20 years we make money from these minerals because demand is going to be so high. It’s going to continue to grow and we are not going to stop raising the royalties on these minerals.”. 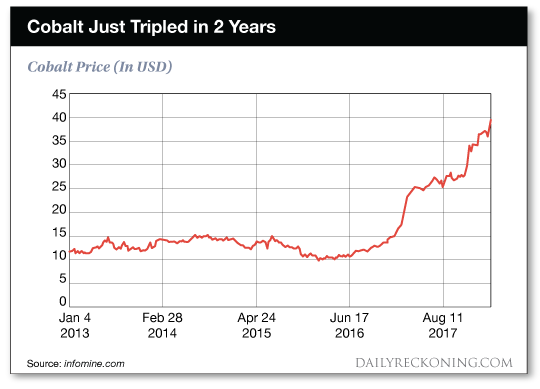 For a commodity that appears to be of critical importance going forward, the supply and demand fundamentals for cobalt are almost comically bullish. Demand growth is going to explode and our sources of new supply are limited. So stock up while you can. Buffett Can’t Buy This Stock... But You Can!